While all the baptized are called to holiness, some men are called by God to holiness through the diaconate. 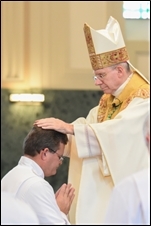 This call must be carefully discerned through a process set forth by the Diocese of Joliet in accordance with the National Directory for the Formation and Ministry of the Permanent Diaconate in the United States. ts of Columbus, liturgical and pastoral ministries, along with corporal works of mercy. The call to the diaconate begins with the desire to grow in greater intimacy with Christ the Servant. The first stirrings of a vocation to the diaconate are often explored at a personal level and usually begin with seeking information about the diaconate and the formation program. Here, an individual initially reflects upon the nature of his perceived call. Primacy must be given at this time to the spiritual dimension, and central to this is spiritual guidance. Because every spiritual journey is personal and individual, it requires personal guidance. The pastor and others on the parish staff are particular resources at this time. As the majority of those who inquire about the diaconate are married, they should be directed to pay particular attention to discussing their possible vocation with their wives and families. The initial information and conversations with their pastor and others should assist and encourage these discussions. For a married man, the support and consent of his wife is required. Therefore, both spouses need to make sure that support and consent, even at this early stage of discernment, arise from an informed understanding. An inquiry and eventual application for entrance into diaconal formation is not just a personal and family journey. The Church must accompany it. The parish is the primary experience of Church for most inquirers. It is the responsibility of this community and, in particular, its pastor to invite from among its members those who may be qualified to serve as ordained ministers of the Church. An inquiry about the diaconate and the formation process eventually includes the diocesan Church. Information sessions, the exploration of the criteria for a diaconal vocation, and particular counsel presented by the diocesan diaconate office can aid an individual in his decision to move forward to a formal application. When the inquirer is presented by his pastor and submits an application, the formal process for admission begins. This initial discernment is continued with particular focus on the applicant’s abilities and potential for ordained ministry. Both the applicant and the diocesan Church enter into an intensive screening process. Demonstrated stability in life situations: marriage, family, employment, residence, physical and emotional health. Are you a man attracted to the kind of prayer that spills over into creative service to the Church? Are you the kind of man who is deeply attentive to the Scriptures as an ongoing encounter with Jesus? Are you the kind of man who loves the Church and is willing to abide by her doctrines and morals? Are you the kind of man who desires to evangelize and publicly proclaim your love of Christ and the Church as an envoy of the bishop not merely within the liturgy, but in the very fabric of your very life? Are you the kind of man who possess a deep desire to empower the laity in their essential role as heralds of the new evangelization, embedding yourself deep within the secular world? Are you the kind of man who's willing to enter the vital work of defending the Church’s teaching on the sanctity of life and religious liberty? Are you the kind of man willing to baptize, preach, witness marriage, pray at wakes, visit the sick and counsel the spiritually troubled? Above all, are you the kind of man who has a deep love and reverence for the Holy Eucharist?